Wow. That’s all I can really say about the Turin mattress by Rest Assured that simply defies belief by the outstanding value it offers. This is one of the cheapest mattresses on the market, yet manages to achieve a firm support through its incorporation of the Bonnell open coil spring system. This traditional mattress type is a tried and tested structure and because of its firm feel, is great for your back. Firm mattress might not be to everyones taste but just give the Rest Assured Silhouette Turin Mattress a try and I’m sure you’ll notice the difference a firm mattress can make if you suffer from lower back pain throughout the day. Rest Assured are one of the oldest bed manufacturers and have been going for 115 years. The Silhouette collection is their current standard range and features a selection of mattresses with stylish black piping trim on the edges. The cheap price of the Turin mattress comes from it’s relatively basic nature but it still offers great support and is a really solid mattress (in a good way). 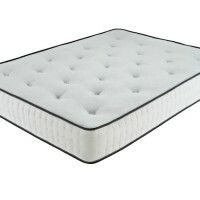 We think we’ve managed to find the cheapest supplier of this mattress mentioned in this review. They offer a price match promise so if you find it cheaper, they’ll match and through in a set of pillows to boot. They sell this mattress as a single, double, king size or superking option which can accommodate nearly all bed frames and divans. Be the first to review “Rest Assured Turin Mattress Reviews” Click here to cancel reply.